The paneer recipe with crispy sauteed veggies is one of the fastest and easiest Indian dishes. The crispiness of veggies such as corn, bell peppers, broccoli will take the dish a notch higher with the added advantage of nutrients. Sauteed vegetables retain their vitamins and minerals, as well as taste and color. It is a quick and easy method to cook vegetables with relatively little oil. Olive oil is a great option for sauteing because it has one of the highest levels of antioxidants and phytonutrients. Paneer which has been used in this recipe will provide you with protein and calcium thus, making it a delicious and nutritious dish. This recipe is perfect for lunch and dinner. Watch the video and try out the yummy recipe today! Add ginger garlic paste to it and saute. To it, add onions, green bell pepper, yellow bell pepper, red bell pepper. Saute them. Add broccoli, mushroom, baby corn, paneer to it. Then add soy sauce, tomato puree and chilli sauce. Spread some corn flour on it while heating. 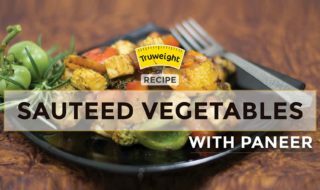 You can now serve your crispy sauteed vegetables with paneer.